Phoenix Art Museum; University of Oklahoma Museum of Art; Munson-Williams-Proctor Institute; Tampa, University of South Florida Art Galleries; Lakeview Museum of Arts and Sciences; Long Beach, University Art Museum, California State University and Austin, Laguna Gloria Art Museum, Focus on the Image: Selections from the Rivendell Collection (at its inception the Marieluise Hessel Collection was known as the Rivendell Collection), October 1986-January 1990, p. 81 (illustrated in color). Born in Donaueschingen, Germany, Anselm Kiefer was deeply influenced by the magic quality of the Black and Oden forests, partly for their sublime beauty and partly because the forest was thought to be the spiritual and sentimental center of the German psyche. After many years away, he returned in 1971 to live there with his then new wife Julia and his work began to reverberate with images fuelled by the surrounding landscape. Many paintings from this period involve imagery of trees or parts of trees, broken branches or logs looking gnarly and in flames. The truncated landscapes are no longer about the mystical side of nature, but instead show the land and its parts as a metaphor for human suffering. Painted atop photographs laid down on burlap, Urd, Werdandi, Skuld depicts tree trunks charred and in flames. 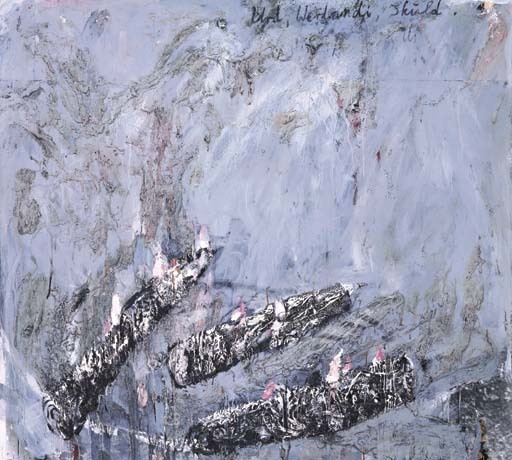 This work is an early and important example of imagery that Kiefer repeats often in subsequent works. Along the edge of each log are the rings that represent the age and life of a tree, giving a hint that the tree parts were once alive. In Germanic mythology, the Norns were a group of supernatural beings who corresponded to the Greek Moirai; they were usually represented as three maidens who spun or wove the fate of men. Some sources name them "Urd", "Werdandi" and "Skuld", meaning "past", "present" and "future". As all-powerful beings, the Norns had the capacity to decide the destiny of all humans and the laws of the cosmos. Kiefer renders each burning log as the other, perhaps symbolizing the stagnant nature of the past, present and future. Do things change as time marches forward? Can the future only look like the past? For Kiefer just as wood is always in danger of burning, so are ideas and values forever in a state of vulnerability. Urd, Werdandi, Skuld poses the provocative question of whether redemption is ever possible.